Every once in a while (ok, my husband will say all the time) I take on a project that completely overwhelms me. 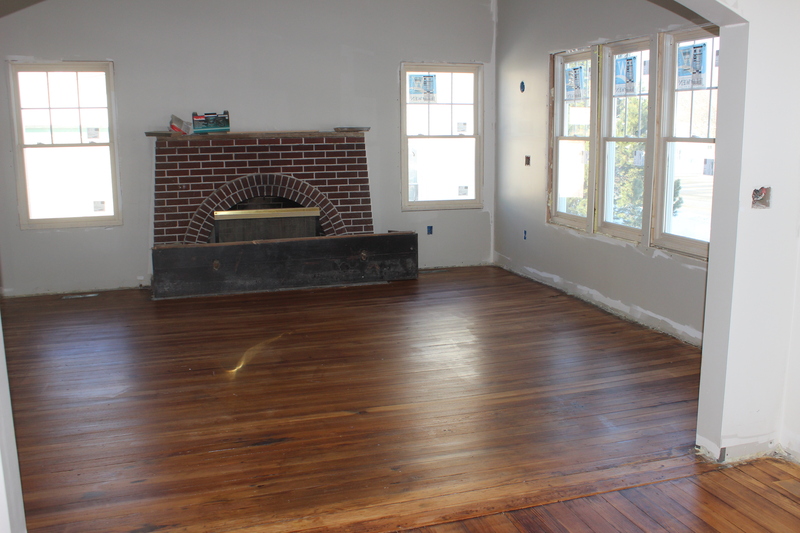 This project in the old house was refinishing the floors. All 9 rooms, a staircase and a hallway. I totally planned to pay someone to do the floors. And then I got the estimates. 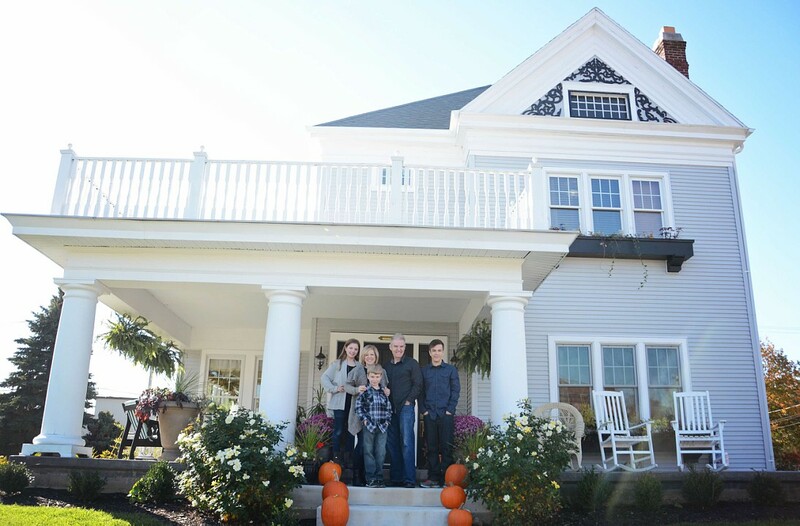 The best one was nearly $6,000 and that didn’t even include the boy’s bedrooms. Since we are soooo far over budget I thought, how hard could it be to refinish wood floors when there is a $6,000 incentive? Turns out it is hard….very hard. And dirty….very dirty…. 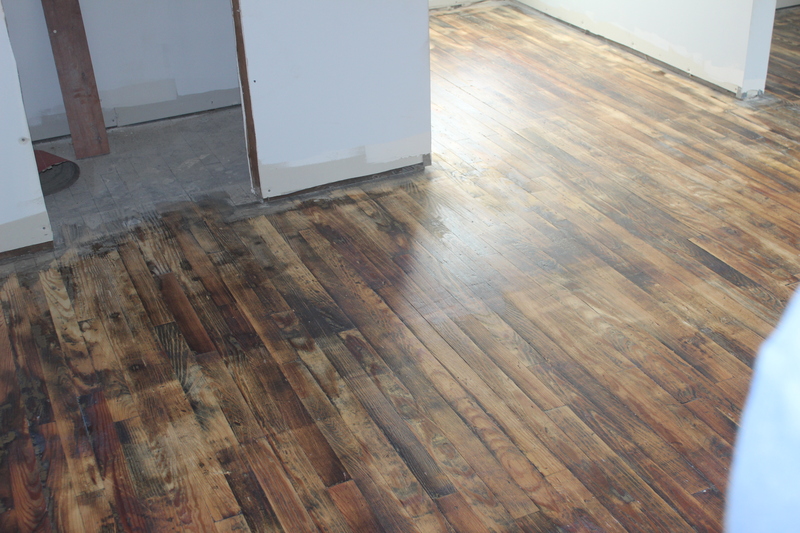 Our floors were in basically decent condition, just covered with years of grime and old varnish. First, I rented a drum sander, had it loaded by the nice tool rental people, got to the house alone with it and discovered it weighed well over 100 pounds. I somehow got it out of the back of the Jeep and into the house. 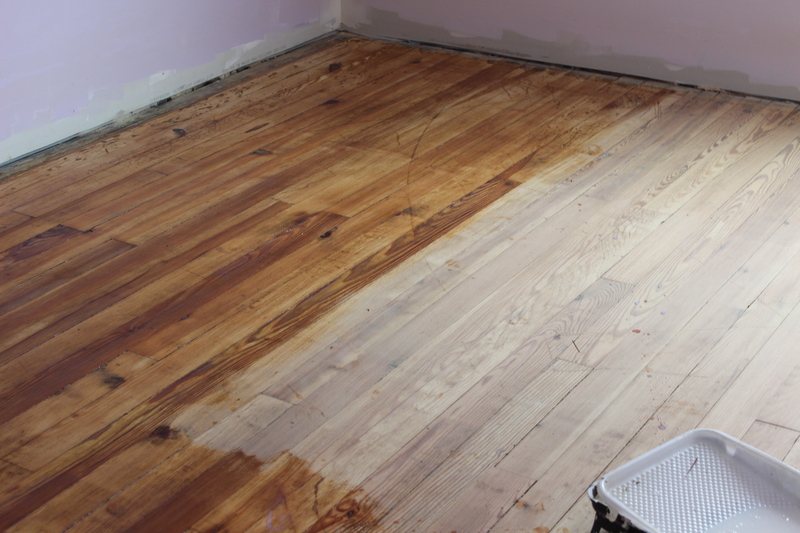 It takes off the top layer of grime and varnish, but is a beast to work with and can easily damage the floors. After 2 full days of sanding I rented an edge sander to get the 6 inches or so around the walls that the drum sander can’t reach. As I was leaving the rental place with it, the guy said to me, “I feel sorry for you. You are going to hate this machine.” Yep….I hated it. It wants to take off on its own and you spend the entire time you are using it wrestling with it. It absolutely kills your back. Then it was on to 4 solid days of sanding all the places where both sanders missed. I bought a heavy duty hand sander and all went well. At first. Then it was one problem after the other when I couldn’t find sandpaper that fit it and ended up retrofitting it with pieces from another sander. After a day of crawling around on the hard floors, I realized if I didn’t get some really good kneepads, I was looking at a double knee replacement! For the final sanding with the fine sandpaper I rented a square sander, which, while still weighing over 100 pounds, can’t do the type of damage a drum sander can. Through the weeks of endless sanding I also replaced belts on rental equipment and rewired the plug on the square sander. I learned to be prepared to troubleshoot rental equipment. During this whole process we pulled about 10,000 nails and staples from the floors. Judging by the leftover bits of carpet we found, at one time the house was covered in a lovely orange shag. I truly believe that as long as we live int he house, we will continue to find staples in the floors. Finally, the last wonderful step – applying the three coats of poly. We have pine floors, which don’t take stain well so we decided to just clear coat them. 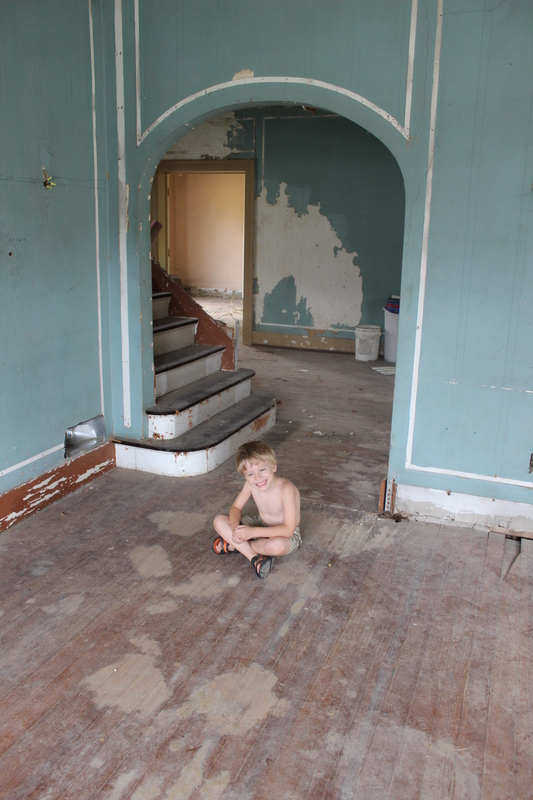 My favorite rooms are the boy’s bedrooms which had been painted, glued, covered with linoleum and subfloor. They turned out very rustic looking. 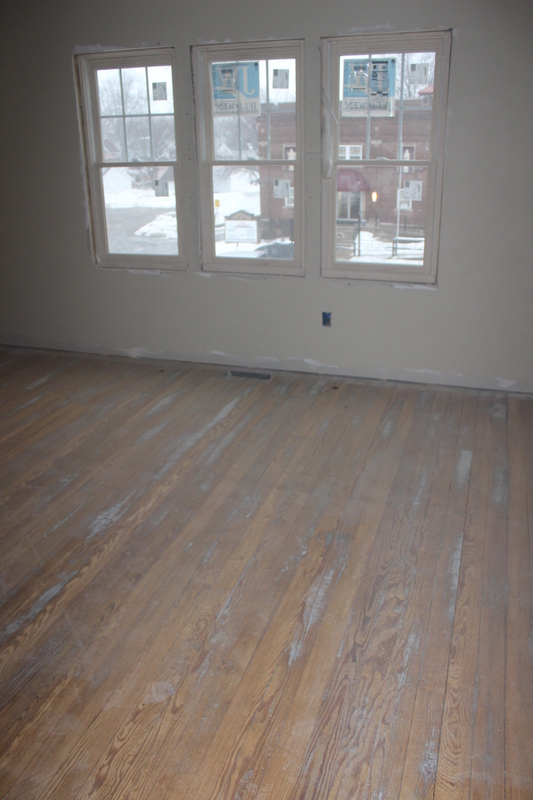 The rest of the floors look as good as can be expected for floors from 1860. There are marks and stains that will never come out, but that’s what furniture and throw rugs are for. So, if you visit the house after it’s finished and see an area rug in a rather odd place, you can safely assume it’s covering something up. Really, you can safely assume all rug and furniture placement is strategically done to cover up things. So, all in all, I am glad I put in the work to save $6,000. The floors make a huge difference in the house and make it look more like a home. So if you ever want to refinish the floors in your own house and need some help, all I can say is……call someone else. 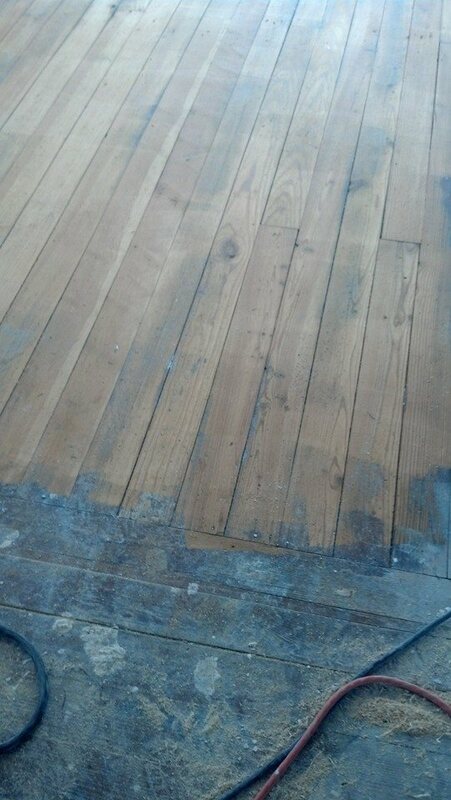 While I am happy the job is done, I will never, ever, refinish a house full of old wood floors again! 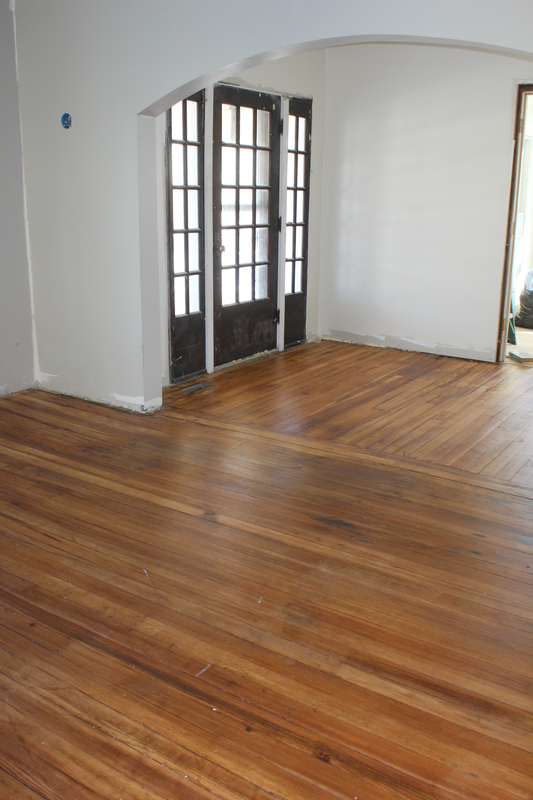 This entry was tagged old floors, old house, pine floors, refinish, renovation, restoration, sander, vintage, wood floors. Bookmark the permalink. your wood floors are groovy. We’re north of Huntington in a 1905 farmhouse & the old part of the house has carpet over pine. the prevous owners said the pine was stained very dark which is okay, but it looks like you can see the pine from the basement. My parents house had oak flooring & it had another layer between the oak hardwood & the basement. Is it okay for just one layer between the basement & the first floor? I want to take the carpet out but yikes big expense! Any remarks would be great-and how is your progress…are you living there yet? Hi! Yes, we are living in the house, however, it is not quite finished. We have gotten used to living with sawdust everywhere! We only have one layer of floors on the first floor too. We put insulation between the ceiling joists in the basement to prevent drafts from coming up. I refinished the floors myself so it wasn’t too expensive, just sander rental and sandpaper, but it is really hard work and unbelievable messy. But with 3 kids and a dog in our house, I don’t want carpet! Thanks for the info. It’s on the list. We bought this house move in ready in 05 and it’s needing some tlc. (except a new roof, hot water heater, water softener- and we need to get the septic empied next year!-that’ll be fun digging up to find the cover!) Problem is money of course. my husband was out of work last year from mar-nov & we’re getting the warchest built up again & i’m anxious to spend $. I work full time so have to have a couple days to get stuff done. It’s not going to happen soon but your house looks fun!